Fiber can be important for someone who deals with diverticulosis or diverticulitis, but it is important to know when to add it. Oatmeal is an excellent source of soluble fiber. 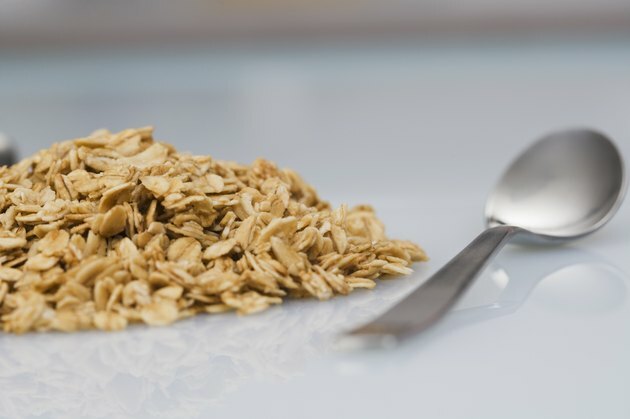 “According to the USDA National Nutrient Database, ¼ cup of oats contains 4.1 g of fiber. (See Reference 2)” Oatmeal is a delicious whole grain that contains an abundance of vitamins and minerals as well as antioxidants. It is also an excellent source of complex carbohydrates, protein and iron. Diverticulosis occurs when increased pressure in the colon pushes outward causing small bulging pouches or sacs (diverticula) in weakened areas of the colon. There may be minimal or no symptoms. Diverticulitis occurs when the diverticula become infected or inflamed. Symptoms of abdominal pain and tenderness in the left lower quadrant of the abdomen are usually present. There may also be constipation or diarrhea. Diverticular disease can be diagnosed by a barium enema, a colonoscopy, an ultrasound or a CT (computerized tomography) scan. With diverticulitis, a doctor will usually recommend oral antibiotics and a diet of clear liquids to allow for bowel rest. Clear broths and pulp-free juices, gelatin and popsicles are good choices. This allows less material to pass through the colon, thereby “resting” it. It is important to follow this dietary advice to allow enough time for the colon to heal. Once the healing has occurred, the doctor will gradually advance the diet to solids and include some low fiber foods. Applesauce, cooked vegetables (no seeds or skins), yogurt and other dairy will provide this level of fiber. If adding meats, they need to be tender and well-cooked. When this can be tolerated, usually after a few days, the diet can be slowly advanced to include foods with a higher fiber content. Always work closely with the doctor’s recommendation for dietary allowances. Fiber will not only assist in keeping the stool soft and helping prevent constipation, but it will also decrease colon pressure which lessens the chances of a diverticulitis flare-up. Vegetables and fruits can be added initially with gradual advancement to beans, brown rice and whole grains. A whole grain that is beneficial for colon health is oatmeal. Additionally, oatmeal is known to provide benefits in heart health, in helping to control blood glucose levels and in possibly reducing certain types of cancer. “According to Corinne Leach, MPH, MS, PhD, getting plenty of whole grains and oatmeal or whole oats is one of the changes that cancer survivors can make to affect their long-term health in a positive way. (See Reference 1)” Always remember to include plenty of water (8 cups) each day when eating a diet that is high in fiber, as the soluble fiber will absorb the water and help keep the stool soft as it passes through the colon.